Moon Dance A bright moon shining over Polynesian nights, reflecting the sparkles of these fine Tahitian pearls. Here worn elegantly on Martinus’ Infinity Hoops. Black 12 mm Tahitian Pearls and 18 karat white gold. $1,950. These stunning earrings feature bright blue faceted natural zircons with the exquisite luster of fine gray Tahitian pearls. 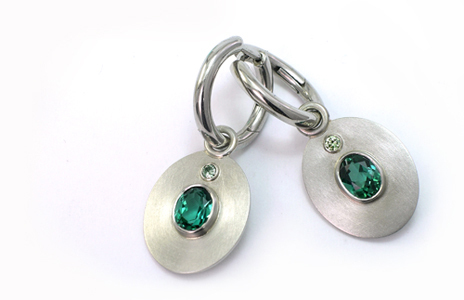 This eye-catching colour combination is elegantly set in polished 18 karat white gold. Elegance and simplicity. Perfect lustrous fresh water pearls will dance with your movements. Feel confident with click-secure Martinus’ Infinity Hoops of 18 karat white gold. The sun was central in Mayan belief and mythology. Here domed disks of matted gold heighten the contrast between the metal and the dispersing light of fine diamonds. The subtle shapes relate beautifully with our Infinity Hoop design. 18 karat yellow gold, diamonds 0.20ct. F/Vs. The blush of a rosy morning. Smooth disks of rose gold harmonize with the pink champagne colours of diamonds. Dynamic and fun, on Martinus infinity hoops for comfort and security. 18 karat rose gold, 2 diamonds 0.43ct natural colour. Solar Flare Elegance and simplicity. Perfect yellow South Sea pearls will dance with your movements. Distinctively worn on Martinus’ Infinity Hoops. Yellow 12mm South Sea Pearls and 18 karat yellow gold. $1,640. Is it genius, is it simple? Enjoy comfort, one-click trusted safety and real ease of use. This Martinus design has become a daily staple in many women’s lives. We produce the shape, the fine hinge and the trusted snap-in sound. It works in all three gold colours. Which colour is your best? Is it the gentleness of yellow gold, the crisp polish of white gold or the elusive rose gold? Wear the hoops on their own or dress them up. See our variety. Discover precious Pearls, gleaming Gemstones, or add some dashing Diamonds. All parts are interchangeable; flexibility we call Infinity Hoops. Have a look what might be yours!